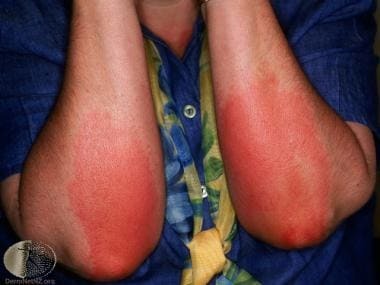 Pressure urticaria may occur immediately (within minutes) or, more commonly, 4-6 hours after a pressure stimulus. [3, 4] For this reason, the term delayed pressure urticaria (DPU) is typically used. It appears as an erythematous, cutaneous, and often subcutaneous edema. The reaction may last up to 72 hours and can be associated with pruritus, burning, and pain. Pressure sites, including the hands, feet, trunk, buttocks, and legs, are most commonly affected. Lesions can be induced by a variety of stimuli, including standing, walking, wearing of tight clothes, and sitting or leaning on a hard surface. See the image below. Delayed pressure urticaria. Courtesy of DermNet New Zealand (http://www.dermnetnz.org/assets/Uploads/reactions/pressure2.jpg). Histamine levels are increased in the lesional skin, while intracellular histamine levels are decreased in peripheral white blood cells. There is also an increased stimulation of histamine release. Despite these findings, histamine is unlikely to be the sole mediator in pressure urticaria. This is further demonstrated in the inconsistent effectiveness of antihistamine treatment in pressure urticaria. The mean age of onset of DPU is in the 30s (range, 5-63 y). DPU is slightly more common in men than in women. Delayed pressure urticaria (DPU) is a chronic disease that can last for years (mean, 9 y; range, 1-40 y). The morbidity of DPU varies, depending on the severity and the response to treatment. In some patients, this condition can be disabling, especially in patients who perform manual labor. Barlow RJ, Warburton F, Watson K, Black AK, Greaves MW. Diagnosis and incidence of delayed pressure urticaria in patients with chronic urticaria. J Am Acad Dermatol. 1993 Dec. 29(6):954-8. [Medline]. Abajian M, Schoepke N, Altrichter S, Zuberbier T, Maurer M. Physical urticarias and cholinergic urticaria. Immunol Allergy Clin North Am. 2014 Feb. 34(1):73-88. [Medline]. Maurer M, Fluhr JW, Khan DA. How to Approach Chronic Inducible Urticaria. J Allergy Clin Immunol Pract. 2018 Jul - Aug. 6 (4):1119-1130. [Medline]. Commins SP, Kaplan AP. Immediate pressure urticaria. Allergy. 2002 Jan. 57(1):56-7. [Medline]. Cassano N, Mastrandrea V, Vestita M, Vena GA. An overview of delayed pressure urticaria with special emphasis on pathogenesis and treatment. Dermatol Ther. 2009 Nov. 22 Suppl 1:S22-6. [Medline]. Lawlor F, Black AK. Delayed pressure urticaria. Immunol Allergy Clin North Am. 2004 May. 24(2):247-58, vi-vii. [Medline]. Jain S. Pathogenesis of chronic urticaria: an overview. Dermatol Res Pract. 2014. 2014:674709. [Medline]. Kaplan AP, Horakova Z, Katz SI. Assessment of tissue fluid histamine levels in patients with urticaria. J Allergy Clin Immunol. 1978 Jun. 61(6):350-4. [Medline]. Weins AB, Mourantchanian V, Eyerich S, Biedermann T, Brockow K. Delayed bullous pressure urticaria: the puzzling role of eosinophils. J Dtsch Dermatol Ges. 2018 Oct. 16 (10):1253-1255. [Medline]. Kerstan A, Rose C, Simon D, et al. Bullous delayed pressure urticaria: pathogenic role for eosinophilic granulocytes?. Br J Dermatol. 2005 Aug. 153(2):435-9. [Medline]. Lawlor F, Bird C, Camp RD, et al. Increased interleukin 6, but reduced interleukin 1, in delayed pressure urticaria. Br J Dermatol. 1993 May. 128(5):500-3. [Medline]. Frezzolini A, De Pità O, Cassano N, D'Argento V, Ferranti G, Filotico R. Evaluation of inflammatory parameters in physical urticarias and effects of an anti-inflammatory/antiallergic treatment. Int J Dermatol. 2002 Jul. 41(7):431-8. [Medline]. Di Lorenzo G, Pacor ML, Mansueto P, et al. Is there a role for antileukotrienes in urticaria?. Clin Exp Dermatol. Mar 2006. 31(3):327-34. Jagodzinska J, Polaniak R, Birkner E, Kasperska-Zajac A. Analysis of circulating vascular endothelial growth factor and its soluble receptors in patients with different forms of chronic urticaria. Biomed Res Int. 2015. 2015:578383. [Medline]. Kasperska-Zajac A, Brzoza Z, Rogala B. Increased concentration of platelet-derived chemokines in serum of patients with delayed pressure urticaria. Eur Cytokine Netw. 2008 Jun. 19(2):89-91. [Medline]. Kasperska-Zajac A, Jasinska T. Analysis of plasma D-dimer concentration in patients with delayed pressure urticaria. J Eur Acad Dermatol Venereol. 2011 Feb. 25(2):232-4. [Medline]. Kasperska-Zajac A, Jasinska T, Grzanka A, Kowalik-Sztylc A. Markers of systemic inflammation in delayed pressure urticaria. Int J Dermatol. 2013 Mar. 52(3):309-10. [Medline]. Jasinska T, Grzanka A, Machura E, Kasperska-Zajac A. Is delayed pressure urticaria associated with increased systemic release of sCD40L?. Biomed Res Int. 2013. 2013:823798. [Medline]. Czecior E, Grzanka A, Kurak J, Misiolek M, Kasperska-Zajac A. Late Dysphagia and Dyspnea as Complications of Esophagogastroduodenoscopy in Delayed Pressure Urticaria: Case Report. Dysphagia. 2011 Jun 5. [Medline]. Magerl M, Altrichter S, Borzova E, Giménez-Arnau A, Grattan CE, Lawlor F, et al. The definition, diagnostic testing, and management of chronic inducible urticarias - The EAACI/GA(2) LEN/EDF/UNEV consensus recommendations 2016 update and revision. Allergy. 2016 Jun. 71 (6):780-802. [Medline]. Dover JS, Black AK, Ward AM, Greaves MW. Delayed pressure urticaria. Clinical features, laboratory investigations, and response to therapy of 44 patients. J Am Acad Dermatol. 1988 Jun. 18(6):1289-98. [Medline]. Grob JJ, Revuz J, Ortonne JP, Auquier P, Lorette G. Comparative study of the impact of chronic urticaria, psoriasis and atopic dermatitis on the quality of life. Br J Dermatol. 2005 Feb. 152 (2):289-95. [Medline]. Champion RH. Urticaria: then and now. Br J Dermatol. 1988 Oct. 119(4):427-36. [Medline]. Morioke S, Takahagi S, Iwamoto K, Shindo H, Mihara S, Kameyoshi Y. Pressure challenge test and histopathological inspections for 17 Japanese cases with clinically diagnosed delayed pressure urticaria. Arch Dermatol Res. 2010 Oct. 302(8):613-7. [Medline]. Barlow RJ, Ross EL, MacDonald D, Black AK, Greaves MW. Adhesion molecule expression and the inflammatory cell infiltrate in delayed pressure urticaria. Br J Dermatol. 1994 Sep. 131(3):341-7. [Medline]. Barlow RJ, Ross EL, MacDonald DM, Kobza Black A, Greaves MW. Mast cells and T lymphocytes in chronic urticaria. Clin Exp Allergy. 1995 Apr. 25(4):317-22. [Medline]. Zuberbier T, Aberer W, Asero R, et al. The EAACI/GA²LEN/EDF/WAO guideline for the definition, classification, diagnosis and management of urticaria. Allergy. 2018 Jul. 73 (7):1393-1414. [Medline]. Dressler C, Werner RN, Eisert L, Zuberbier T, Nast A, Maurer M. Chronic inducible urticaria: A systematic review of treatment options. J Allergy Clin Immunol. 2018 May. 141 (5):1726-1734. [Medline]. Kaplan AP. Diagnosis, pathogenesis, and treatment of chronic spontaneous urticaria. Allergy Asthma Proc. 2018 May 1. 39 (3):184-190. [Medline]. Metz M, Ohanyan T, Church MK, Maurer M. Retreatment with omalizumab results in rapid remission in chronic spontaneous and inducible urticaria. JAMA Dermatol. 2014 Mar. 150(3):288-90. [Medline]. Geller M. Successful treatment of occupational delayed pressure urticaria and angioedema with omalizumab. Ann Allergy Asthma Immunol. 2016 Jan. 116 (1):81-2. [Medline]. Maurer M, Metz M, Brehler R, Hillen U, Jakob T, Mahler V, et al. Omalizumab treatment in patients with chronic inducible urticaria: A systematic review of published evidence. J Allergy Clin Immunol. 2018 Feb. 141 (2):638-649. [Medline]. Damiani G, Diani M, Conic RRZ, Colli L, Ferrucci S, Martina E, et al. Omalizumab in Chronic Urticaria: An Italian Survey. Int Arch Allergy Immunol. 2019. 178 (1):45-49. [Medline]. Quintero OP, Arrondo AP, Veleiro B. Rapid response to omalizumab in 3 cases of delayed pressure urticaria. J Allergy Clin Immunol Pract. 2017 Jan - Feb. 5 (1):179-180. [Medline]. Grundmann SA, Kiefer S, Luger TA, Brehler R. Delayed pressure urticaria - dapsone heading for first-line therapy?. J Dtsch Dermatol Ges. 2011 Nov. 9(11):908-12. [Medline]. Swerlick RA, Puar N. Delayed pressure urticaria: response to treatment with sulfasalazine in a case series of seventeen patients. Dermatol Ther. 2015 Sep-Oct. 28 (5):318-22. [Medline]. Kulthanan K, Thumpimukvatana N. Positive impact of chloroquine on delayed pressure urticaria. J Drugs Dermatol. 2007 Apr. 6(4):445-6. [Medline]. Dawn G, Urcelay M, Ah-Weng A, O'Neill SM, Douglas WS. Effect of high-dose intravenous immunoglobulin in delayed pressure urticaria. Br J Dermatol. 2003 Oct. 149(4):836-40. [Medline]. Metz M, Altrichter S, Ardelean E, Kessler B, Krause K, Magerl M, et al. Anti-immunoglobulin E treatment of patients with recalcitrant physical urticaria. Int Arch Allergy Immunol. 2011. 154 (2):177-80. [Medline]. Mitzel-Kaoukhov H, Staubach P, Müller-Brenne T. Effect of high-dose intravenous immunoglobulin treatment in therapy-resistant chronic spontaneous urticaria. Ann Allergy Asthma Immunol. 2010 Mar. 104(3):253-8. [Medline]. Lenormand C, Lipsker D. Efficiency of interleukin-1 blockade in refractory delayed-pressure urticaria. Ann Intern Med. 2012 Oct 16. 157(8):599-600. [Medline]. Eskeland S, Tanum L, Halvorsen JA. Delayed pressure urticaria treated with the selective serotonin reuptake inhibitor escitalopram. Clin Exp Dermatol. 2016 Jul. 41 (5):526-8. [Medline]. Nettis E, Colanardi MC, Soccio AL, Ferrannini A, Vacca A. Desloratadine in combination with montelukast suppresses the dermographometer challenge test papule, and is effective in the treatment of delayed pressure urticaria: a randomized, double-blind, placebo-controlled study. Br J Dermatol. 2006 Dec. 155(6):1279-82. [Medline]. Perez A, Woods A, Grattan CE. Methotrexate: a useful steroid-sparing agent in recalcitrant chronic urticaria. Br J Dermatol. 2010 Jan. 162 (1):191-4. [Medline]. Vena GA, Cassano N, D'Argento V, Milani M. Clobetasol propionate 0.05% in a novel foam formulation is safe and effective in the short-term treatment of patients with delayed pressure urticaria: a randomized, double-blind, placebo-controlled trial. Br J Dermatol. 2006 Feb. 154(2):353-6. [Medline]. Liu RH, Werth VP. What is new in the treatment of steroid-induced osteoporosis?. Semin Cutan Med Surg. 2007 Dec. 26(4):203-9. [Medline]. Hartmann K, Hani N, Hinrichs R, Hunzelmann N, Scharffetter-Kochanek K. Successful sulfasalazine treatment of severe chronic idiopathic urticaria associated with pressure urticaria. Acta Derm Venereol. 2001 Jan-Feb. 81(1):71. [Medline]. Kozel MM, Sabroe RA. Chronic urticaria: aetiology, management and current and future treatment options. Drugs. 2004. 64(22):2515-36. [Medline]. Lawlor F, Black AK, Ward AM, Morris R, Greaves MW. Delayed pressure urticaria, objective evaluation of a variable disease using a dermographometer and assessment of treatment using colchicine. Br J Dermatol. 1989 Mar. 120(3):403-8. [Medline].